Wondering where to begin with your January home organizing? Start in the kitchen with the refrigerator, pantry staples, and making a list of foods to plan your meals for the month. Comfort that begins in the kitchen promotes daily satisfaction and motivation. Begin with a cup of hot tea or coffee (or Coffeccino as in my January 10th morning kickoff). Next, clean the refrigerator and organize frig magnets. Throw away old leftovers, organize fruits, vegetables, condiments, etc. You’ll feel better when your frig smells clean and looks shiny, free from smudges and germs. Make a list of fresh vegetables and fruits to add to your grocery list. Check the pantry now to see what staples you need. Make a list of things you need to organize like various sizes of baggies, foil, plastic wrap, paper bags – and don’t forget the toothpicks. Recently, my hubby came home with the coolest little refrigerator magnet. A toothpick holder! I love it. No one has to wonder where the toothpicks are anymore. They are in full sight, the main place people gravitate to in the kitchen. The frig. Past New Year’s kitchen staples in my past experience often required a visit to the grocery store for stocking up on broth, soups, and vegetables. That wasn’t because of New Year’s diet resolutions. It was because the family was participating in a church-wide fast. Fast as in no food. Just water. At least, that’s the way it was in my growing-up days. When you end a fast, you don’t end it with pizza or meatballs and spaghetti. You end it carefully with broth, soups, and vegetables. Fasting is not popular on lists of how to keep healthy these days. Eating small meals throughout the day is. Back in the day, we called that grazing. Whether you choose to go on a fast, start eating small meals, or simply cut back on your eating, the beginning of the year is a good time to begin. Starting January off with nutritious soups and vegetables is a good thing. It is good on the digestive system. Give your stomach a rest from filling up on rich foods. Personally, I like to begin my nutritious food list after January 8th, not on January 1st. This has nothing to do with being an Elvis Presley fan to the extent of celebrating his birthday. It’s because January 8th happens to be my birthday. Yes, I do like to eat at my favorite restaurants and enjoy certain foods, including dessert, on that special day. Share your favorite recipes with the above ingredients below in the comment section. 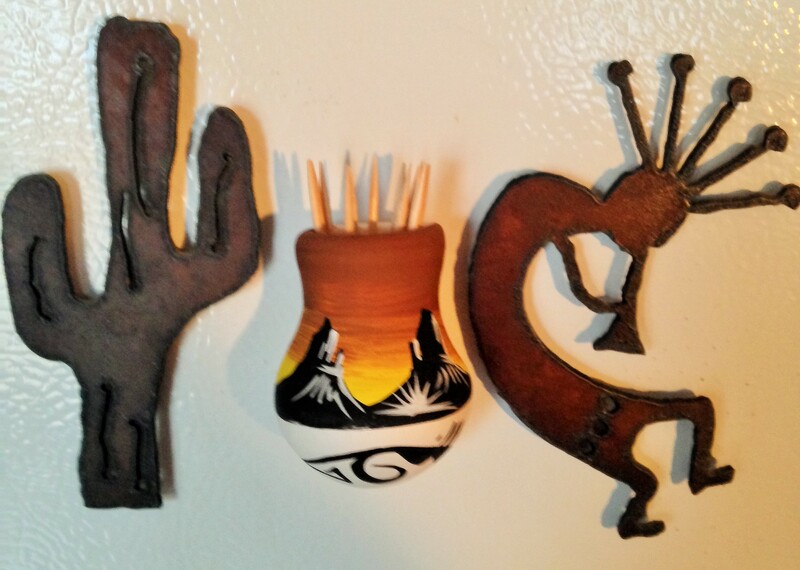 Very southwest decorum on the fridge. I love the toothpick holder between the other two magnets. The toothpick holder is quite the handy little magnet!